Fuego has been an innovative contributor to the gas grill market since inception and has previously launched award-winning designs such as their Element and Classic lineups. In 2018, they launched the Fuego Professional F24C which has proven to be a customer favorite. Just like the previous product offerings, Fuego's thoughtful design and creative engineering is prominent throughout the new F27S and F36S models. The launch is set to shake up the luxury grilling market. We set out to design a premium gas grill that has amazing design aesthetics, performance at the highest level and doesn't break the bank compared to other grills in its class. In an industry where the majority of products are a carbon copy replica of one another, Fuego set out to shake up the status quo. To do so, Fuego focussed on three points of impact: Design, Performance and User Experience. While Fuego’s premium lineup might look like many grills at first glance, it offers some key design elements that stand out from the rest. It features collapsable recessed shelves that eliminate the bulky (ugly) look seen elsewhere. When needed, the shelves slide up with a simple lift of the handle for use and fold right back down when not needed to be hidden away and fit nicely under its cover. The front control panel was given a facelift, eliminating the bulbous front end, which is more in line with modern design trends. The residue tray and LP tank are stored conveniently behind the door, easy to access but not necessary to be seen. It’s black accents paired with premium grade 304 stainless steel work to balance the look of the grill versus staring at a shiny metal box. Thoughtful design was certainly at the forefront of the equation when developing the new premium series. While, improving the design, it was of the utmost importance to not sacrifice any performance. Performance standards of heating to 500F in just 5 minutes and 650F+ overall holds true across all Fuego models. The premium lineup boasts 40,000 BTU/hr and 60,000 BTU/hr across two and three burners respectively. 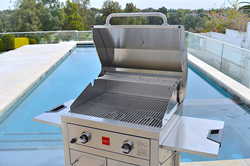 The grills utilize customized U-shaped burners that look and act like a four (4) and six (6) burner grills while only being two and three burner grills. This design allows the heat to be evenly distributed throughout the firebox, thus helping to minimize hotspots. Most would stop there, but Fuego set out to deliver a better overall experience for the customers. The products ships fully assembled to the customer’s driveway for easy setup in about 20 minutes with no fasteners for the customer to assemble. Simply unpack and set a few items such as the grates and diffuser panels in place. Adding to this customer experience, Fuego shocked the market by offering the premium 304 SS grill at fraction of the competitors pricing. The F27S retails for $1499.00 and the F36S is set at $1999.00.